As you may already know but I like to play the bass guitar and early this year I got this idea of making a bass guitar. There was one specific model that I always wanted to buy but the price was a bit out of my reach so I thought to make a copy of that model. "It's just a piece of wood and strings, how hard can it be?" I thought so I bought some hard maple and mahogany, frets, abalone inlays etc., all what's needed to make a complete guitar. 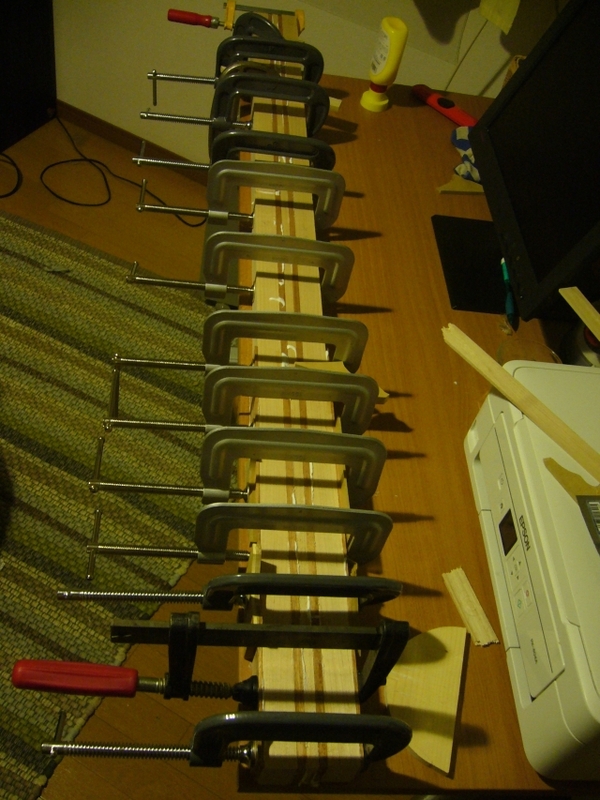 The guitar I set to make was neck-through type bass guitar. This means that the guitar is basically one big piece of wood with the neck going all the way from the top to the bottom through the body of the guitar. My wood crafting skills are from elementary school but armed with confidence I set to work. First was to glue the pieces of maple and mahogany together (already pre-cut). 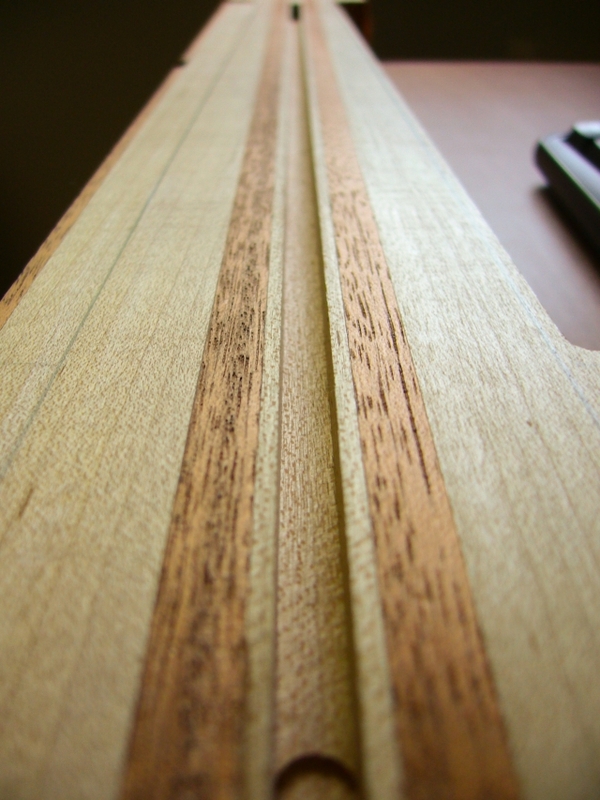 Once glue was cured enough I routed the channel for the truss rod using a router. Next routing the headstock, piece of cake! Well, not actually. It's been harder than I thought but finally it's starting to resemble something of a bass guitar. Hi everyone! Please excuse my long absence from the blog! It was summer's fault: the wonderful weather and sunny days led me outside, camping, going to the beach everyday, I was so busy having a great time! ...right? No, not really. It's been a very busy summer for me, and only recently I completed one of my recent projects, a collection of all my past published comics that will come out in November! I'm very excited for it but I'm afraid it won't come out in Japanese or English, sorry! Sapporo instead seems to be preparing for the autumn at last, but I'm quite relieved that the weather is still warm. Well, at least warm enough to keep strolling around on my bicycle! I'm going to be very sad the day I have to part from my bike like last year, put it in the garage and bid her farewell for a few months. But at least, when I take it out again next year I'll go for a long trip with her. More details about that in a future update! Sapporo, stay warm as long as possible! You must have noticed chit chatters that I love eating, I love good food espacially desserts and cheese! However you may know that sometimes I do miss my French food... Mind me I love Japanese food and believe it or not but I missed it while I was away in France for the summer! But let me explain you why I really miss French food! However this is what makes the experience all the more interesting! You see, you have very little surprise in your own country when talking about cuisine... but for us travelers surprises make our day! And sometimes you come across a divine speciality and for me it is named Sweet Red Bean Paste (Anko)! What about you traveling chit chatters? Have you ever tried Japanese food abroad? Or have you ever compared foreign cuisine in Japan and abroad? I look forward to hearing about your experiences next time you call in! "I'm so happy the summer is almost over". These aren't words I ever expected to hear myself utter. Frankly, it had never occurred to me before that there could be such a thing as "too much summer". But then I came to Japan. I have always had wonderful summers as a boy. My parents are both from cities on the opposite side of the country, so summers were spent on the back of our car, travelling from one relative to another, usually ending the trip at my mother's parents' town which is very close to the Black Sea. That meant I had a few good weeks of beach-going. Wake up early morning, get your beach towel, make a few sandwiches for lunch, a watermelon or two, some melons, water and lots of books. Pack all that in tightly and get in your car. The trip usually takes 40 minutes during which you go trough gentle hills smiling with the year's harvest of sunflowers, wheat and corn. You weave your way down to this year's favorite beach location, find a nice shade to park your car under and head down to the half empty beach. Rinse and repeat. I miss summers in Bulgaria.